Last updated Sunday, November 9, 2014 | Some dates still available! Welcome to Clearwater's hidden gem. Affordable Luxury can be found at our Grand Venezia Condo, located directly on Tampa Bay Waters. Our spacious 1870 square foot, main floor condo is professionally decorated in Tommy Bahamas furniture and completely equipped to accommodate 6 to 8 people. The Master Suite has a flat screen TV, King Size Bed, Walk in Closet. Master Bathroom has double sinks and a Roman Tub. The two guest rooms each have Queen size beds, flat screen TV and large closets. Sit back on the comfortable leather sofa in the spacious Living Room and enjoy 300 channels of digital television. For extra guests - the leather sofa in the Family Room converts to a queen pull out. The interior is beautifully finished with granite counters throughout, tiled floors, marble surround gas fireplace and crown moldings. Added Bonus! -- The Imagination Room, located just off the living room, has a games table and is great for lounging, reading, surfing the net or simply enjoying the view with a good cup of coffee, or a glass of wine. Gourmet Kitchen has a gas stove, full refrigerator with ice maker, microwave, blender, toaster, coffee maker, coffee grinder, dinnerware, silverware, wine glasses, cookware and spices. This suite has a great laundry room for large crowds with a brand new High Efficiency washer, dryer, ironing board and iron. Free WIFI and free long distance within the US and Canada. Grand Venezia is an Exclusive 24 hour Guard Gated Community and offers many upscale amenities. Enjoy our newly opened Meditteranean Style Clubhouse with heated pool, hot tub, sauna, gym, and Bistro Area. Play tennis, go fishing off the dock, take an evening stroll along the lighted walkways.Stop At the Loggia to see the dophins play in tha Bay or watch the Manitee swim in our Marina. Clearwater Beach (voted as Florida's best beach!) is only a 10 minute drive, Busch Gardens a 30 minute ride, you can even do Disney World, Universal Studios Orlando (90 minutes) and come back to our peaceful retreat. There are many golf courses in and around Clearwater, the closest being next door at Cove Cay Golf Community (you can BOOK TEE TIMES here). Many fishing charters are also available in the area - we recommend Dos Amigos (www.clearwatersportfishing.com, (727) 443-4653). If you're a sports enthusiast there is no shortage of things to do. Want to catch a game? There are several major sports franchises all within 15 minutes. Football: Tampa Bay Buccaneers, Hockey: Tampa Bay Lightning, Baseball: Tampa Bay Rays. Come and watch the Phillies and the Blue Jays in Spring Training - tickets are very reasonable. If college sports is your passion, this is the place to stay! Finish your sporting experience with a round of golf at a PGA course. Here are some of our favorite restaurants nearby. This is our favourite seafood place. 100 N. Indian Rocks Road. A great lunch/afternoon spot to eat about 4 miles from the condo. Located across from the famous Safety Harbor Spa and Mineral Springs. When you call for a reservation ask for a table with a view of the water. You will not be disappointed! * Panera Bread: Quick Breakfast/lunch, located in Clearwater mall north of the condos where Costco and target are. * Chickfilet: Quick drive through lunch - locations all over - organic chicken and great prices. * Also in the clubhouse there is a library with pamphlets and brochures for other restaurants, casinos, places to visit, things to see. Tampa International Airport (TPA) is a 17 minute drive. St. Petersburg/Clearwater Airport (PIE) is a 5 minute drive. We know Jack personally and we highly recommend his transportation service. Call Jack in advance and he will pick you up at either the TPA or PIE airport. Prices are the same as a cab and no line up. We have a video of our condo below!. See our condo for yourself! Here's a video of the interior and the grounds. Visit our listing at VRBO.com to see the latest rates information and up to the minute availability. Our beautiful condo has Tommy Bahama furniture throughout, a granite kitchen & bathrooms and flat screen TVs in each bedroom. Clearwater is the smallest of the three principal cities in the Tampa-St. Petersburg-Clearwater metropolitan area, most commonly referred to as the Tampa Bay Area. 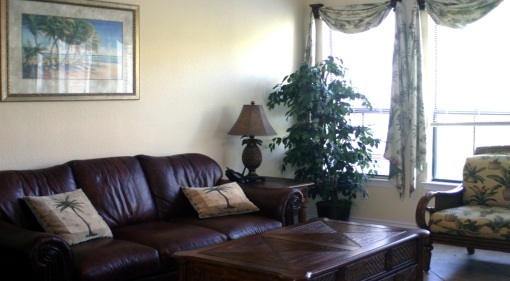 Our condo is located in the Grand Venezia gated condo community in Cleawater, FL. Our community is on the west shore of Old Tampa Bay. We make sure that our rates are always the best in town for the luxury & quality of stay that we offer. There may be cheaper alternatives but if you want a luxurious stay at a convenient location we're confident you'll find none better than ours. We've been married for over 15 years and have two wonderful sons. Whether you're staying with us right now or want to inquire about doing so, email us any time!